Pass protection is of the utmost importance in today’s pass-happy NFL, but finding a consistent, high-performing pass protector at tackle is easier said than done. The good prospects come off the board early in every draft, and the good veterans get paid handsomely for a reason. 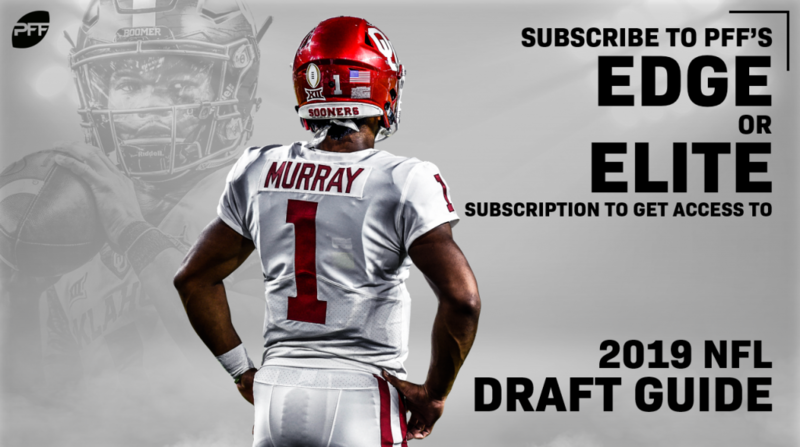 Here’s a list of the top-five offensive tackles entering the 2019 NFL Draft ranked by PFF’s pass-blocking efficiency. 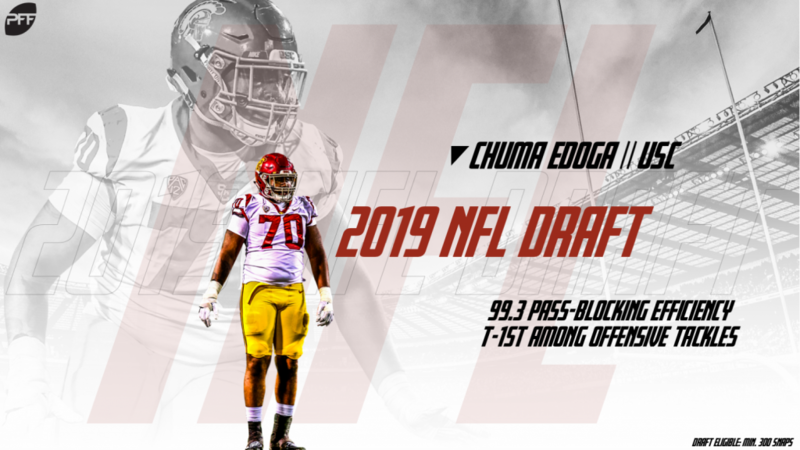 Chuma Edoga, an athletic freak and USC’s primary right tackle for each of the past two seasons, allowed just four hurries across 304 pass-blocking snaps in 2018. With no sacks or hits allowed tied to his name, the 6-foot-3, 308-pound Edoga ranked tied for first in PFF’s pass-blocking efficiency (99.3). 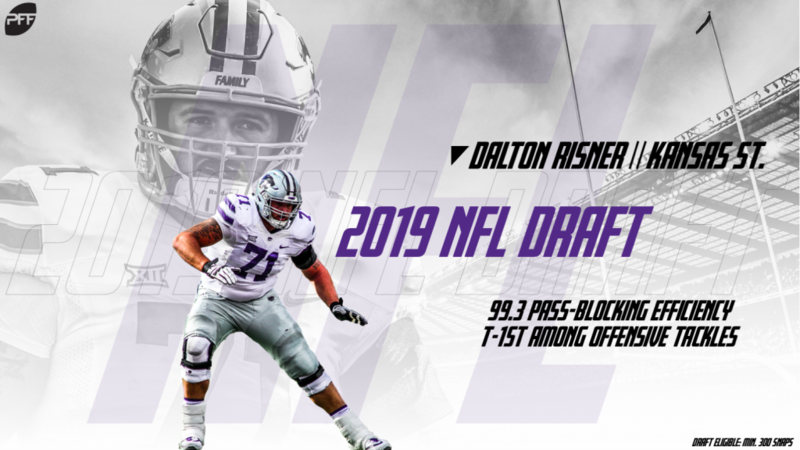 Kansas State’s Dalton Risner tied Edoga at the top of this list with his 99.3 pass-blocking efficiency a year ago. He allowed just five total pressures (two hurries, three hits) across his 352 pass-blocking snaps in 2018. 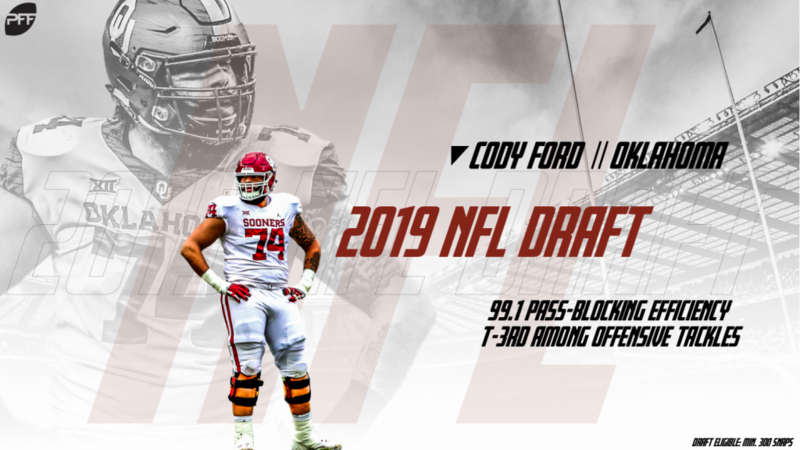 Despite making the switch to tackle just this season, Oklahoma’s Cody Ford turned in an impressive 99.1 pass-blocking efficiency in 2018, allowing just six hurries and one sack across his 441 pass-blocking snaps. 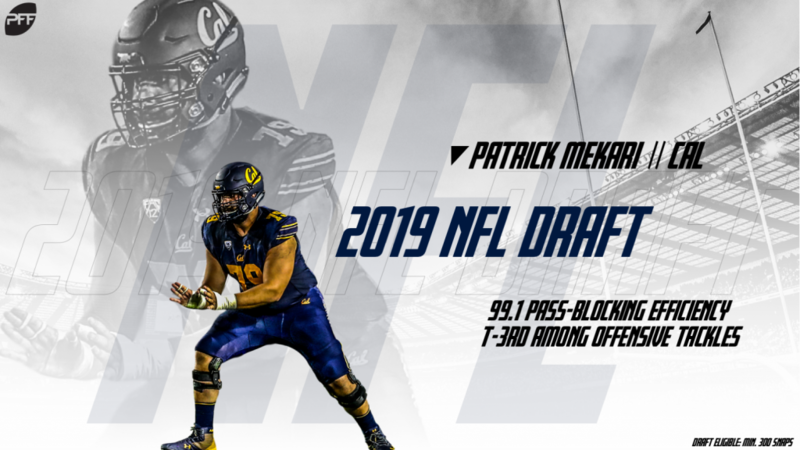 Tagged as just a three-star recruit (ESPN) coming out of high school, Patrick Mekari didn’t get a ton of love in the recruiting process, but he has since exceeded expectations in his collegiate career with the Golden Bears. Starting at left tackle in 2018, Mekari allowed just seven total pressures (six hurries, one hit) on his 377 pass-blocking snaps en route to an impressive 99.1 pass-blocking efficiency. 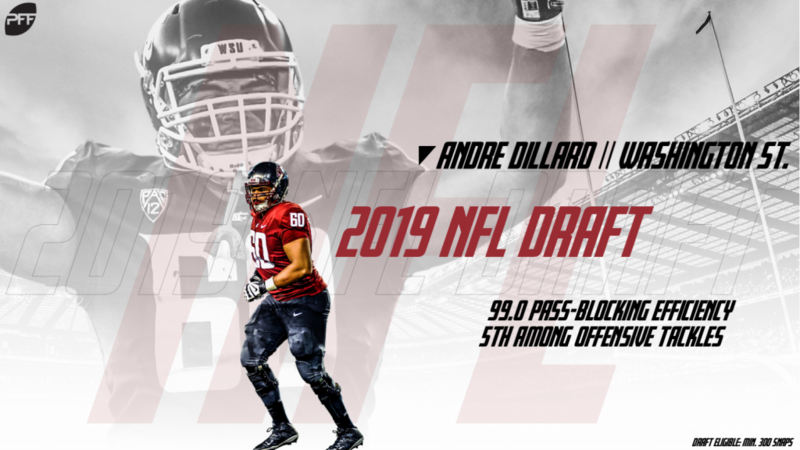 Andre Dillard destroyed the 2019 NFL Combine and has risen up draft boards as a result. The 6-foot-5, 315-pound Washington State product recorded an absurd 4.96s 40-yard dash and a 4.4s short shuttle in Indy, and his play prior to the Combine wasn’t so bad, either. He allowed just 13 total pressures (10 hurries, two hits, one sack) across an FBS-high 722 pass-blocking snaps in 2018, earning the fifth-best pass-blocking efficiency (99.0) among qualifiers.